This article explains the calculation of clamping force in push-in type back-wired electrical receptacles or switches and offers a comparison of the relative clamping force of spring-clip wire connectors with that exerted by binding head screw or screw clamp connectors for electrical wires. 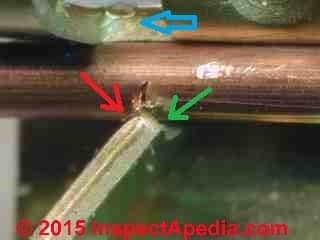 At page top we illustrate a #14 solid copper wire being pushed into the backwire opening of a common electrical receptacle. The wire has not been pushed fully into the connection as I wanted to show the diameter of the wire entering the push-in connector opening. Simple screw terminals are also visible in the lower left of the photo. This article series illustrates and explains possible electrical failures and fire risk when using the push-in rear connectors on some back-wired electrical devices such as receptacles and switches. We illustrate the typical connector used in some receptacles and switches that accept a simple push-in connection usually found on the rear of the device. The rectangular opening is used to release an installed wire. Why is Electrical Connector Clamping Force Important? Force in an electrical contact is important because as experts have pointed out, when we examine an electrical contact at very high magnification we learn that the contact surfaces are in fact not smooth but bumpy such that electrical current must actually flow through a myriad of bump-contact-points between the two surfaces. At BACKWIRED DEVICE SPRING CLIP DETAILS we describe the spring-clip connector used in push-in type back-wired electrical receptacles that rely on a spring rather than a screw to hold the electrical wire in place. At WIRE-TO-CONNECTOR LIMITATIONS in PUSH-IN ELECTRICAL CONNECTORS we describe some limitations of spring-clip type electrical connectors including the risk of achieving only a rather small electrical contact surface between the electrical wire and the connector. In both of those articles we cite the critical importance of the combination of both contact area and contact force in establishing a good electrical connection between a wire and the connecting device. The mechanical area of contact [between a wire and an electrical connector] is often very much less than that deductible from bulk properties. The indented italics above give three re-statements of the point that clamping force in an electrical connector is critical. So what is the connection's clamping force: the pressure exerted by the connecting device and the electrical wire? With this question in mind we explored first a comparison of contact area comparing a screw connector with a spring-clip connector for electrical wire connections. At ELECTRICAL SCREW CONNECTOR TORQUE-FORCE I described some rough estimates of the torque force exerted when tightening a clamping-screw wire connector on a receptacle. We continue that investigation with help from Jess Aronstein. Our correspondent expert, Dr. Jess Aronstein has kindly offered details about the measurement of the force exerted by the spring in a push-in type spring clip electrical connector. I have not been able to find any data on the spring characteristics of the push-in receptacle contacts. There is a simple way of estimating the contact force in the push-in backwired terminals, however. Measure the force needed to slide the wire in fully after it has initially been inserted enough to be under the spring. The initial insertion force is high, and then, once the spring is over the wire the force is essentially smooth and constant for the 1/4" or so of remaining insertion. That is the portion where you should measure the force. Instead of a soft wire, however, use the smooth shank end of a hardened steel drill bit as a gage pin. Use a drill size that approximates the size of the wire that you are interested in. A 1/16" drill is approximately the same size as #14 AWG wire. Using this method, I measured the four push-in terminals on each of two new receptacles that I happened to have here, one a P&S and the other a Leviton. The range was 2-1/4 lb to 3-1/2 lb, the average was about 3 lb. So, the spring force is essentially equal to the push-in sliding force. If we assume that the average torque applied to the screw (clamp or binding head) terminal 10 in-lb, then the clamping force is (according to the Kaiser Aluminum analysis) 225lb. There is of the order of 75x greater actual area of contact in a duplex receptacle wire termination at a screw terminal than in a push-in terminal of the types so far examined. One question that is often asked is, "why it is so hard to pull the wire out, doesn't that show that the contact force is much higher?" The answer is in the geometry of the connection, by which the spring notches into the copper wire and prevents pullout. That does not increase the contact force unless the pullout force is maintained. With the hardened steel drill shank used in the test the spring does not create a notch, and the pullout force is approximately the same as the push-in force. 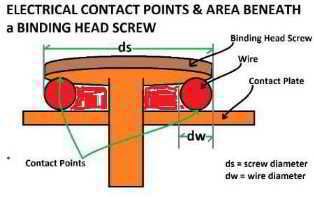 I hope that helped answer your question about the relative actual contact area in the screw terminal vs. push-in. - J.A. My curiosity in reading the section still leads me back to electrical resistance, which is directly related to heat generation. I would not expect electrical resistance to be linearly related to contact pressure. Rather, from previous tests I’ve run I’d expect that resistance would increase until some contact pressure, and then change little as pressure continued to increased. Thus the increased pressure from one connector to another may or may not influence heating. - Lee Shields. by private email to D.F. 2015/12/09. Mr. Shields worked as a forensic engineer in the automotive industry and is a member of the editor's family. I expect Jess may agree with you; he has done seminal work on "micro-arcing" that is the actual basis for the increase in heat resistance and overheating and ultimately fires in electrical wiring. The arcing burns the surface and increases the resistance. I don't think Jess is as concerned about micro-arcing on copper to copper connections however. I don't think the resistance changes so much over time as with AL wire. The articles I reviewed were focused on the micro-contact areas and my lay interpretation was that the contact pressure affected the number of micro-contact areas and implicitly resistance that might be more problematic if more current were flowing through too-few points of contact. Perhaps contact area and pressure and resistance are all together in one formula. I'm looking into Babu (2001) and Timsit (1998) cited below. Aronstein, Jess,[Personal communication, J.A. to the editor (Daniel Friedman)], 26 November 2015. Dr. Jess Aronstein, protune@aol.com is a research consultant and an electrical engineer in Schenectady, NY. Dr. Aronstein provides forensic engineering services and independent laboratory testing for various agencies. Dr. Aronstein has published widely on and has designed and conducted tests on aluminum wiring failures, Federal Pacific Stab-Lok electrical equipment, and numerous electrical products and hazards. See ALUMINUM WIRING BIBLIOGRAPHY and FPE HAZARD ARTICLES, STUDIESand also BACK-WIRED ELECTRICAL DEVICES for examples. Babu SS, Santella ML, Feng Z, Riemer BW, Cohron JW. Empirical model of effects of pressure and temperature on electrical contact resistance of metals. Science and Technology of Welding & Joining. 2001 Jun 1;6(3):126-32. 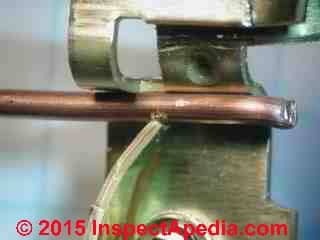 An important input property in the development of process models for resistance spot welding is electrical contact resistance. A model for the pressure and temperature dependence of electrical contact resistance was developed from established concepts of contact resistance. The key to developing the desired relationship is determining surface roughness characteristics, which is experimentally problematic. To overcome this difficulty the electrical resistance of contacting interfaces was measured as a function of the pressure applied across the interfaces. Using known information about the temperature dependence of bulk resistivity and mechanical properties, a curve fitting procedure was used to establish the desired relationship of contact resistance to pressure and temperature. This empirical model agrees well with experimental measurements in the regime of low applied pressure. At high pressures, predictions underestimate contact resistance, and this was attributed to strain hardening of asperities at the contacting interface. The model also predicts that the competing effects of bulk resistance and contact resistance will produce a peak in the variation of contact resistance with temperature. The model provides a suitable means for incorporating the pressure and temperature dependence of contact resistance into process models of the resistance spot welding process. Barber, J. R. "Bounds on the electrical resistance between contacting elastic rough bodies." In Proceedings of the Royal Society of London A: Mathematical, Physical and Engineering Sciences, vol. 459, no. 2029, pp. 53-66. The Royal Society, 2003. A method is developed for placing bounds on the electrical contact conductance between contacting elastic bodies with rough surfaces. An analogy is first established between contact conductance and the incremental stiffness in the mechanical contact problem. Results from contact mechanics and the reciprocal theorem are then used to bracket the mechanical load–displacement curve between those for two related smooth contact problems. This enable bounds to be placed on the incremental stiffness and hence on the electrical conductance for the rough contact problem. The method is illustrated by two simple examples, but its greatest potential probably lies in establishing the maximum effect of neglected microscales of roughness in a solution of the contact problem for bodies with multiscale or fractal roughness. Chang, W. R., J. J. Hwang, F. B. Weng, and S. H. Chan. "Effect of clamping pressure on the performance of a PEM fuel cell." Journal of Power Sources 166, no. 1 (2007): 149-154. Kogut, L., and K. Komvopoulos. "Electrical contact resistance theory for conductive rough surfaces separated by a thin insulating film." Journal of applied physics 95, no. 2 (2004): 576-585. Kogut, L., and K. Komvopoulos. "Electrical contact resistance theory for conductive rough surfaces." Journal of Applied Physics 94, no. 5 (2003): 3153-3162. A general electrical contact resistance (ECR) theory for conductive rough surfaces was derived from first principles. The analysis is based on fractal geometry for the surfacetopography description, elastic-plasticdeformation of contacting asperities, and size-dependent constriction resistance of microcontacts. Relations for the ECR in terms of contact load and apparent contact area are obtained for isotropic, homogeneous, conductive surfaces with known material properties and surfacetopography. Useful design guidelines for electrical contacts are extracted from the numerical results. A general relation between the dimensionless real contact area and the dimensionless ECR is introduced for lightly loaded contacts that depends only on the electron mean free path. Approaches for determining the surface roughness, material properties, and real contact area are discussed in the context of relatively simple ECR measurements. Pascual JI, Mendez J, Gómez-Herrero J, Baró AM, Garcia N, Binh VT. Quantum contact in gold nanostructures by scanning tunneling microscopy. Physical review letters. 1993 Sep 20;71(12):1852. RECEPTACLE WIRE-TO-CONNECTOR CONTACT AREA SIZES - measurements & calculations of the contact area between an electrical wire and the connecting device on an electrical receptacle or switch explain differences between push-in type backwire connectors, compression plate connectors, and binding head screw connectors, all of which are found on many electrical receptacles and switches. Slade PG, editor. Electrical contacts: principles and applications. CRC Press; 2013 Dec 17. Timsit, Roland S. "Electrical contact resistance: properties of stationary interfaces." In Electrical Contacts, 1998. Proceedings of the Forty-Fourth IEEE Holm Conference on, pp. 1-19. IEEE, 1998. The paper reviews the dependence of electrical contact resistance on the shape and dimensions of /spl alpha/-spots and on the magnitude of the mechanical contact load. The range of validity of the classical voltage-temperature relation for electrical contacts is also examined. The paper describes experimental evidence of breakdown of the classical electrical theory when /spl alpha/-spots become too small. One of the interesting and useful properties of relatively small /spl alpha/-spots is that they are subject to large surface stresses. These stresses induce /spl alpha/-spot growth. Vogler M, Sheppard S. Electrical contact resistance under high loads and elevated temperatures. surfaces. 1993 Jun 1;9(10):11. Continue reading at RECEPTACLE WIRE-TO-CONNECTOR CONTACT AREA SIZES for a discussion of the areas of wire-to-receptacle contacts on electrical receptacles, or select a topic from closely-related articles below, or see our complete INDEX to RELATED ARTICLES below. 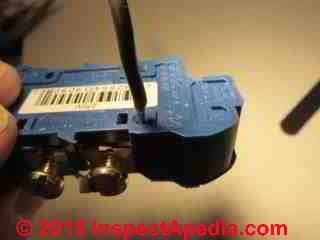 WIRE-TO-CONNECTOR FORCE COMPARISONS at InspectApedia.com - online encyclopedia of building & environmental inspection, testing, diagnosis, repair, & problem prevention advice.